President Moon Jae-in on Sunday pushed ahead with the appointment of Kang Kyung-wha as foreign minister, despite fierce resistance from opposition parties over his choice of Cabinet members. The decision put the liberal leader on a collision course with the opposition holding an outright majority in the unicameral parliament when key agendas are pending, including the supplementary budget and government reorganization plans. 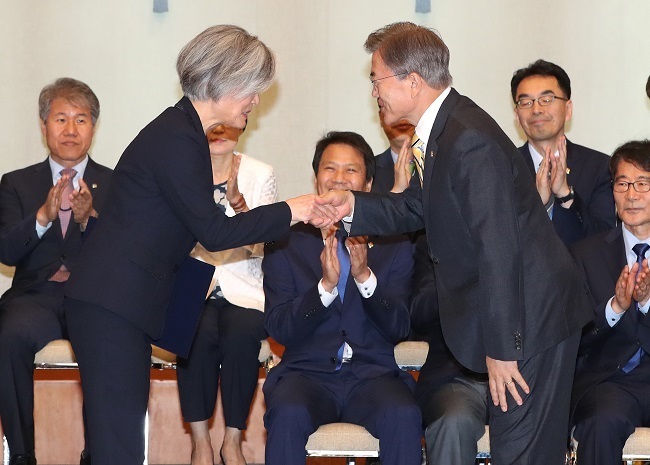 “It is regrettable that the parliament (continued to oppose the appointment), but with the imminent Korea-US summit and the Group of 20 summit to follow, we could no longer leave the Foreign Ministry post unfilled,” Moon told Kang, after presenting her with a certificate of appointment. Kang pledged to exert her best efforts in preparing for the Korea-US summit and to meet with her US counterpart, Secretary of State Rex Tillerson, prior to Moon’s departure for Washington later next week. Shortly after the presidential conferment ceremony, Kang headed to the ministry to receive reports on the upcoming summit and updates on North Korea’s nuclear provocations, according to ministry officials. “The Korea-US summit is just around the corner so I have come to follow up on the preparations,” Kang told reporters while entering the building, saving further remarks until after the inauguration ceremony. Kang‘s inauguration as the nation’s first female foreign minister is to take place Monday at the Seoul Government Complex building. The foreign minister’s appointment drew divided responses from the political circle. The ruling liberal Democratic Party of Korea stressed the urgent need to activate the Cabinet and the pressing political timeline for the bilateral summit, while the largely conservative opposition accused the president of a power monopoly and lack of communication. Further kindling the controversies over Moon’s choice of Cabinet members was Ahn Kyong-whan, the justice minister nominee who stepped down Friday amid disputes over his sexist comments and a forged marriage registration in his 20s without the consent of his then-girlfriend. “The president shall not have the opposition’s cooperation over the (revision of) the Government Organization Act or the supplementary budget bill,” Rep. Kim Myung-yeon, chief spokesperson of the main opposition Liberty Korea Party, said in a statement. The hard-line conservative opposition also held a floor meeting in the afternoon to discuss protest actions, including mass boycotts of pending parliamentary schedules. The centrist People’s Party and the minority conservative Bareun Party also complained that the president shut out the opposition’s feedback on Kang’s qualifications. “During her confirmation hearing, Minister Kang honestly admitted her faults and offered a sincere apology,” ruling party spokesperson Rep. Kim Hyun said in a statement, welcoming the appointment. Though announced on May 21, only 10 days after Moon’s swearing-in, Kang’s nomination has been in deadlock for the past four weeks due to what the opposition saw as ethical lapses, including her past record of a false residence registration. Though the flaw had been considered trivial in hearings held under former administrations, the opposition related it to Moon’s earlier vow to strictly exclude rule-breakers from high-profile government posts. The fact that the presidential office had pre-emptively revealed the violation, asking for the people’s understanding on the matter, did little to alleviate the backlash from the opposition camp. The political divide grew even further as Moon decided last Tuesday to appoint Kim Sang-jo as chairman of the Fair Trade Commission without parliamentary consensus. While the appointment of prime minister, Constitutional Court chief, Supreme Court chief, and Board of Audit and Inspection chief require the approval of the full parliamentary floor, minister-level Cabinet members may take office upon presidential designation, if the Assembly fails to set its stance within due time. As the approval of Kang’s nomination was thwarted last Wednesday, Moon immediately requested on the following day for the Assembly to endorse her report by Saturday, effectively telling opposition parties that he would appoint her regardless of their decision. 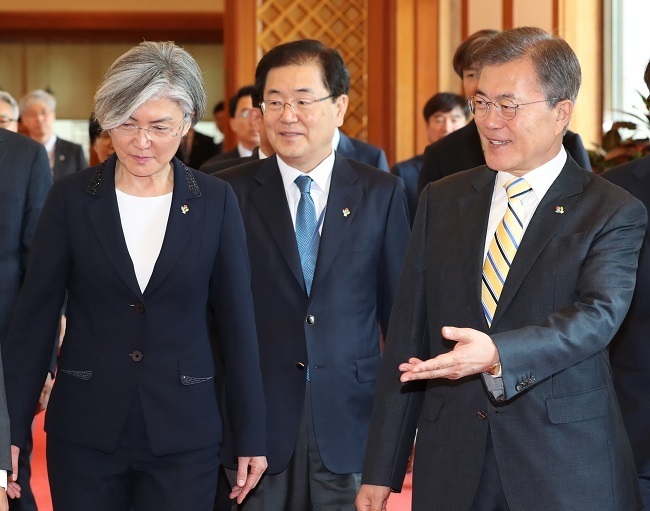 “Our Constitution and laws are very clear on the authority of the president and of the legislature upon government personnel,” Moon said Thursday in his weekly meeting with the secretariat, hinting at moving ahead with Kang’s appointment. The confirmation hearing and the consequent parliamentary process of endorsing the hearing report are supplementary means to thoroughly verify the qualification of minister nominees, he also added.